Look at all those gorgeous vegetables, beans and kielbasa! 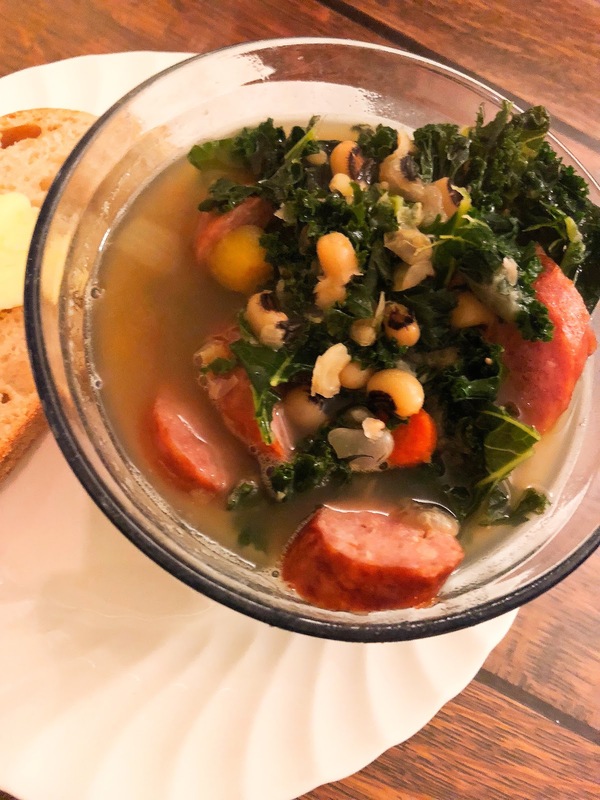 Pull out your pressure cooker for this quick, easy, and healthy Pressure Cooker Kale Black Eyed Pea Soup. It'll be on the table in 30 minutes or so, including prep time making it a great weeknight dinner! Since the kale is cooked in the broth, all of the micro-nutrients are maintained, making this a very healthy and hearty soup indeed. When I made this soup for the family, used a quart of turkey stock from the freezer made after Thanksgiving with the carcass and trimmings of the turkey we smoked. It had an incredibly delicious smokiness that complimented the kielbasa wonderfully. If you have the chance to smoke a turkey, I highly recommend it! I also challenge you the next time you roast or buy a roasted chicken from the store, try your hand at making your own stock from scratch! Recently I was asked the difference between "stock" and "broth." As we wander the aisles of the grocery store, both are on the shelf and what's the difference? I had to think way back to my culinary school days, turning it over in my mind and finally I remembered. Stock is an ingredient, used to make a finished product. A broth is a finished product that is ready to be served. So, when you are making chicken noodle soup, you use chicken stock to make it. The stock becomes the broth of the soup when it is incorporated with the vegetables, noodles, chicken herbs and spices. By in large, it's a matter of semantics, and the products in the store are interchangeable, but if you're using the language of chefs and food service professionals, stock is stock and broth is broth. Now you know! Without further ado, here's the recipe for this easy and delicious soup for you to try tonight! Place first four ingredients in pressure cooker, pressure cook high 20 minutes. Release pressure, add kale and kielbasa. Pressure cook high 5 minutes. Check beans and kale, cook longer if necessary- (ours were a little overdone at 30 minutes, oops). Adjust salt and pepper. Bon Apetit!